Without realizing it, I’ve been in shock for almost 2 days now. The reality finally sunk in about 6 hours ago, and I’ve been so excited/worried/stressed/etc… about everything that I have been unable to even consider going to bed (even though Julie and I promised each other that we would get a good night’s sleep tonight), but at some point I will need to go to sleep for the last time in Canada for at least the next 12 months even if it’s just a quick power nap before heading to Pearson. I have many emotions, and I already miss my family, but I am also sure I’m forgetting something crucial for our trip. I know this is probably a typical feeling for any traveller, but lets just say that I’ve never taken this big of a leap before. I’ve crossed off pretty much everything on my list, but I still have a nagging feeling that I’m going to get on the plane and realize I left the coffee on or something. Ok, I just took a couple deep breaths and that has made it possible to keep writing this post, but I’m not sure how much steam I have left. So, we made it to the airport in one piece. 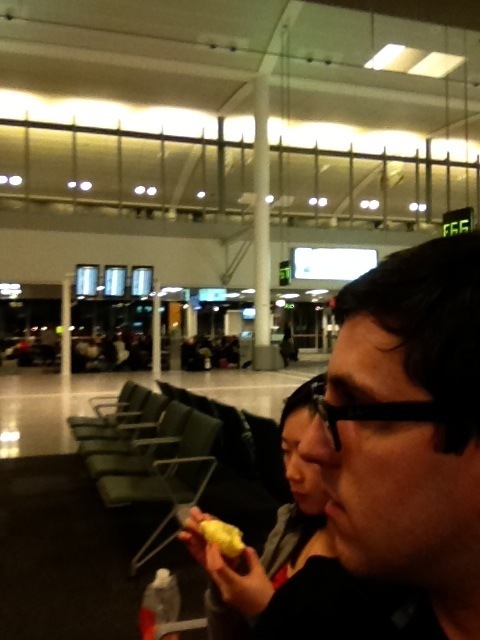 And YYZ has free wifi now!!! Maybe they always had it, but I’ve never NOT had a mobile service with me and had to rely solely on the benevolence of the airport gods like I do now. One of the most stressful things that I experienced since deciding to do this trip was cancelling my mobile service, and I of course left it until the complete last minute to do so. I’ve been pretty firmly entrenched in the ‘world-de-cell’ since I spent 100$ and bought my first Nokia 5190 from Fido in 1997 (before Rogers got ahold of it). I also had a 416- number that I was really not looking forward to parting with, but the 15$/month Bell was demanding to put my account on hold would only be valid for 6 months, and additionally since I don’t have a job anymore, I had to cancel it. That is until the generous mr_hanna senior offered to pay for a plan for my mom who could take over my number (PS: don’t call my number anymore because my mom has that number now… At least until I get back;) and keep it alive. Of course this required much back and forth with ol’ ma’ Bell, right up until their offices closed at 6pm yesterday (I literally had to call them at 5:55pm to finalize the details). But I did it! I’m not proud of how much that one particular item stressed me out, but its just further evidence that I need to get away. So, after 2 fitful hours of sleep and much bleary eyed goodbye-ing to family and furry cats who we already miss dearly, here we are at gate F67 waiting to board our 8:10 flight to LAX. Until we meet find free wifi again. ← Our Condo is Officially Leased!